Blaaad Clatt! Hail the man! 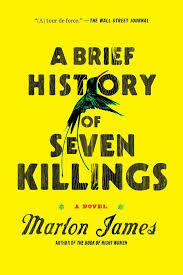 The Jamaican Marlon James won the Booker Prize with A Brief History of Seven Killings on the assassination attempt on Bob Manley in 1976. I was right there the night ‘they’ tried to ‘assassinate’ Bob Marley. December 3rd 1976 Hope Rd Kingston: I was sipping rum in an apartment right across the road from Bob’s mansion on the main road called Hope. (I was a wetter not a drier ie rum not herb). Hope Rd. takes frantic hustling traffic from the border of Kingston & its up -town neighbour St. Andrew. This very prominent artery from ‘alfway tree’ up to Papine & the University passes the ultra prestige residence of the Prime Minister -Jamaica House, a very near neighbour to Bob. As I said I was sipping a rum with some good friends: a Brit Asian –Sach, a Marxist development economist, his partner at the time Pam, daughter of a leading member of the British C P and their neighbour the Cuban ‘cultural attaché’ aka intelligence service. So when the guns started to bark we thought it was in the parking lot of the apartments. Were they coming for us? The Cuban grabbed his hand-gun but we were on the floor, flat, creeping to peep through the louvered windows. The date is important December 3rd for Bob was due to perform at a massive free public concert in Kingston on the 5th of December just 10 days before election day December 15th –and already nuff people had been locked up in detention in an attempt to cut down on the violence. For in the 70s in JA guns and gangs controlled garrison communities & defended their party or candidate. “Who a yu defend?” was the call of political operatives and the correct answer was often a life-saver. Even that night traveling home on my little Honda, road-blocks had been set up but whose road –block- ‘Babylon’, ‘fi wi ’ or ‘dem’? That was the issue around Bob. For it was seen …scene… that Bob ‘defend’ (favoured) the Government party of Michael Manley –the People’s National Party. (now there is a name for progressive radical nationalism.) So the opposition neo-liberal Jamaica Labour Party led by Edward Seaga (they) simply wanted to warn Marley and so sent some of their gunmen to ‘hot up his place’ to threaten and intimidate the man, not kill him. The two warrior parties had their backers in the global context: Manley was very pro Cuba, Seaga (CIAga on the gulley walls) was very pro-Washington and so once again the surrogate cold –war became a hot war in the streets of Kingston. The fact that the two leaders belonged to elite “white’ society made hostilities even more vicious (also the fact that their constituencies were neighbours sharing the dreams of the extreme poor in the ghettos of Central & West Kingston). I had been in Jamaica since 1968 (ex Kirkcaldy) as a young drama teacher /tutor/director and through 76 had worked as theatre coordinator for Carifesta held in Kingston even within the pre- election hot times. Manley had found money (in the face of tough talk from the IMF) to mount a great Caribbean cultural festival and build a beautifully designed Cultural Training Centre of four colleges of Art, Music, Dance and Drama in one integrated complex. (Now called the Edna Manley Centre after his mother, a renowned artist). I had just been appointed director of studies of the School of Drama and many of our new student intake were from the inner city communities on the front line of the bullet. They knew the drama. Edward Seaga of Syrian/Lebanese background was born in the USA and his Jamaican mother was a Wilson with a Scottish father. Seaga was to become PM of Jamaica in 1980 after a blood-war with 900 dead. He was to become the fifth PM of Jamaica and all five had close Scottish ancestry … but that is another story. Jack Mandora me nu choose none. Got to read the hard Jamaican Marlon James novel. There is the dramatic irony that Booker made its fortune from sugar estates in the Caribbean mostly Guyana. So ‘it come back… fly away home to Zion fly away home…selah’! Sorry , but not at this moment being stoned out of my head , I cannot make head nor tail of this ”article” , nor see the point of it . A terrrific article, thank you Thom. The Booker is generally so tame. It’s great to see a virtuoso novel like this getting a wider audience. Go, Marlon James! And the other Scottish link – the last time a Booker winner caused ‘controversy’ with ‘swearing’ and violence was when the great Jim Kelman won in 1984 with ‘How Late it was, How Late.’ Love it when the Empire writes back. Like James, above, I really wanted to read this article but cannot make head nor tail of it; in part, that’s my fault for failing to understand dialect phrases; but a wee bit of punctuation would have made all the difference and helped the reader work out what was the point of the article. Love this article and the fact that Marlon James just won the Booker. Just started reading 7 Killings and am loving the Jamaican patois. Understanding comes with the reading, the sound and the context. As, say, Irvine Welsh’s readers across the world discovered, without too much difficulty.